Fifty-six tons of methane — a potent greenhouse gas — entered the air over Northampton County in 2015, and that amount could increase if a compressor station is built there as part of the Atlantic Coast Pipeline. Co-owned by Dominion Energy and Duke Energy, the controversial $5.5 billion project would pipe natural gas from a fracking operation in West Virginia through Virginia and North Carolina — and possibly South Carolina. The utilities have applied to the NC Department of Environmental Quality for a permit operate a new compressor station for the pipeline in Pleasant Hill, near the Virginia border. The station will include natural-gas fired compressor turbines, an emergency generator, storage tanks and other equipment. The purpose of the station is to boost pressure in the pipeline to send natural gas farther down the line. That request prompted DEQ to hold a public hearing tonight at 6 p.m. at Garysburg Town Hall, 504 Old Highway Road. Speakers can register beginning at 5 p.m. 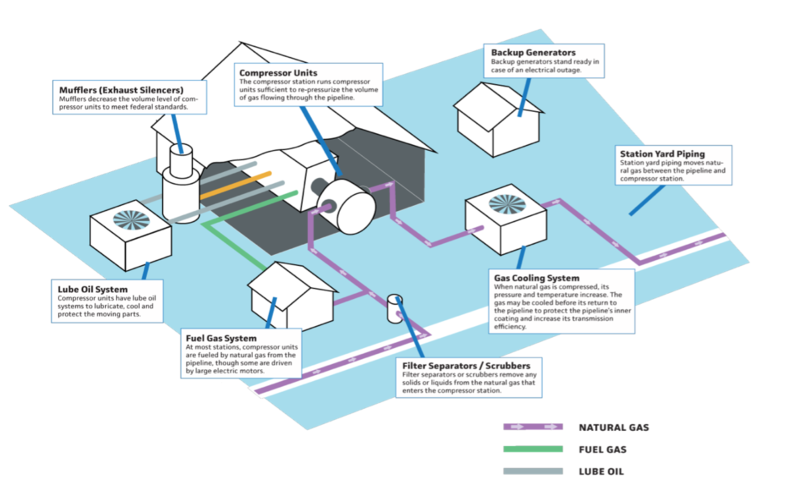 Compressor stations can emit volatile organic compounds, particulate matter, nitrogen oxides, carbon monoxide, sulfur dioxide, greenhouse gases, and small amounts of hazardous air pollutants, such as benzene, acetaldehyde, formaldehyde, toluene, ethyl benzene and xylene. With just 20,000 residents — 58 percent of them Black — Northampton County nonetheless is home to several polluting industries. Many of them involve the timber sector: paper and pulp mills, and an Enviva wood pellet plant. Air permits allow industry to emit certain amounts of pollution, based on federal and state regulations. For example, industrial sources legally emitted over 239,000 tons of carbon dioxide and nearly 100 tons of ultrafine particulate matter, known as PM 2.5, in 2015, according to DEQ’s air emissions inventory database. PM 2.5 is especially harmful because the particles are so small they easily enter and burrow into the lungs, and can cause respiratory illness. Northampton County industry was responsible for another 48,000 pounds of formaldehyde, 3,232 pounds of benzene, plus dozens more pollutants in 2015, the most recent year for which figures are available.